This was opening night of the 13th Annual Noir City Festival, held at Hollywood's Egyptian Theatre. My daughter and I met for dinner at the Hard Rock Cafe at Hollywood and Highland, then headed over to the Egyptian. Before the film I had the pleasure of meeting Eddie Muller, head of the Film Noir Foundation, when he graciously signed my copy of his book DARK CITY. I mentioned my participation in the recent blogathon and was quite gratified to learn he was familiar with this blog. It was a wonderful opportunity to meet someone whose work I've admired for several years now. 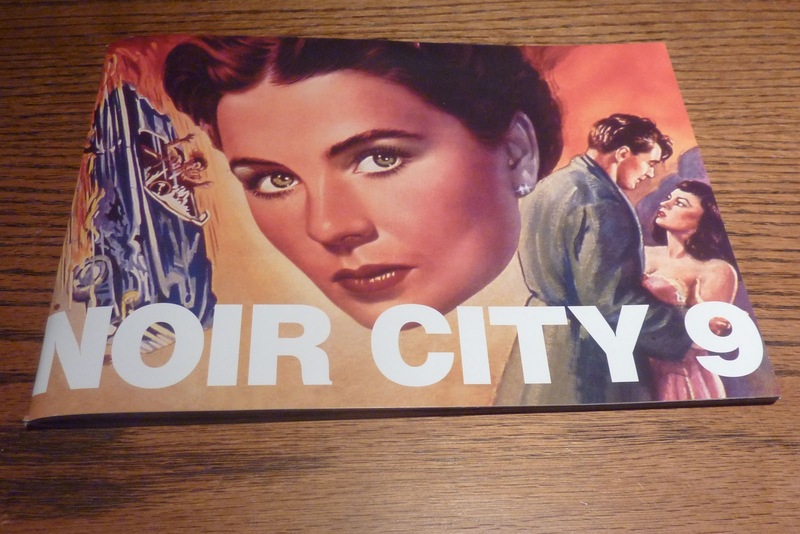 I purchased the program prepared for January's Noir City 9 Festival in San Francisco; as with last year's program, it's a beauty, with page after page of glossy photos and stills. If you attend the festival and have the opportunity to purchase the program, it's a great value for $5. Mr. Rode, incidentally, also introduced the UCLA screening I attended of CRY DANGER (1951) a couple of weeks ago. I tried to describe the thrill of seeing pristine black and white 35-millimeter prints in my post written after seeing THE CRUSADES (1935) at UCLA last weekend. Tonight's experience was very similar; at times during HIGH WALL (1947) I couldn't get over how beautiful the film was. Seeing a perfectly projected, mint condition 35-millimeter print brings home in a whole new way that films are visual works of art. I expect to return to the festival soon -- if all goes well, as soon as Sunday's screening of WHIPLASH (1948) with Dane Clark, Alexis Smith, and Zachary Scott, paired with THE HUNTED (1948), starring Preston Foster and the ice skater turned actress Belita. 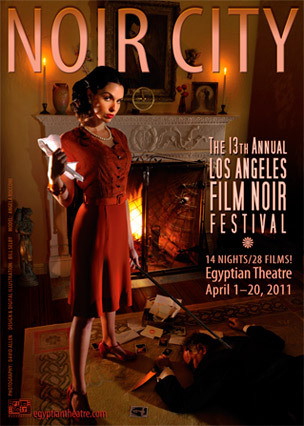 Related posts: A Visit to the Noir City Film Festival (2010); Schedule Announced for Noir City 13 in Hollywood; L.A. Times Preview of Noir City 13. Reviews of films seen at the 2011 Noir City Film Festival (to be periodically updated): STRANGERS IN THE NIGHT (1944); WHIPLASH (1948); THE HUNTED (1948); THE TWO MRS. CARROLLS (1947); THE DARK MIRROR (1946); JOURNEY INTO FEAR (1943); FEMALE ON THE BEACH (1955); HAZARD (1948); BEWARE, MY LOVELY (1952); FRAMED (1947); MR. SOFT TOUCH (1949). New related post: Another Night in Noir City, which also links to a previous review of THE BRIBE (1949). April 14th Update: Here's a link to my review of CAUGHT (1949), posted a little over a year ago. What a treat to see it in a beautiful print on a big screen this evening! Thanks, Dorian. It was a great evening and a great couple weeks. Eddie's a terrific guy and a lot of fun to hear speak on film noir.